Notice what is being created here: signs and seasons, days and years - a calendar! This is the establishment and foundation from which we are told, directly from Yehovah Himself, that we can determine dates. Of these, the first that should be immediately obvious and distinct from the others is the fact that His calendar is based on the use of signs. More specifically, the lights in the firmament of the heavens are used as these signs! Firmament, being the Hebrew word raqia (Strong's 7548), also translates as "expanse"; whereas the word heavens, being shamayim (Strong's 8063) in Hebrew, more specifically is referencing the "sky" above us. Therefore, it is the lights in the expanse of the sky above us that serve as signs for us to know His seasons, days and years. Also take note that these signs are being described from an observer's perspective here on earth, not from some far off place floating somewhere out in the solar system. There is no scientific description given here, no mythical secrets, no complicated rules and absolutely no mathematical formulas. This is telling us that, in order to understand time and the Biblical calendar, we simply need to look up to the sky! "accomplish, advance, appoint, apt, be at, become, bear, bestow"
This verse, then, is telling us that Yehovah appointed, or bestowed, the sun and the moon to serve as our signs in the expanse of the sky. In other words, this does not necessarily mean the sun or moon were being created here from scratch, but rather they were being placed into their proper alignment and being set into motion so as to provide lights as signs to those looking up at any time (day or night). The sun and the moon are simply being assigned a prominent role in how each one plays a part along with the stars to divide the day from the night. And it is these signs that, as you will soon discover, are referenced throughout the scriptures! It is from this point forward that the sun and moon were ordained into their continuous cycles as we know them today (with only Yehovah having the power to change their courses - as we will later see an account where He did just that in order to temporarily extend the day to last longer). There is one other aspect introduced in the Creation Week here in Genesis and that is the first, and only, mathematical concept you will find in scripture related to the calendar: counting days. "226 A signal (literally or figuratively), as a flag, beacon, monument, omen, prodigy, evidence, etc; a mark, miracle, sign, token (in the sense of appearing)." Therefore, these signs are the form of communication from Yehovah - a flag or beacon - that appears in the sky and is meant for us to take notice - or to mark! 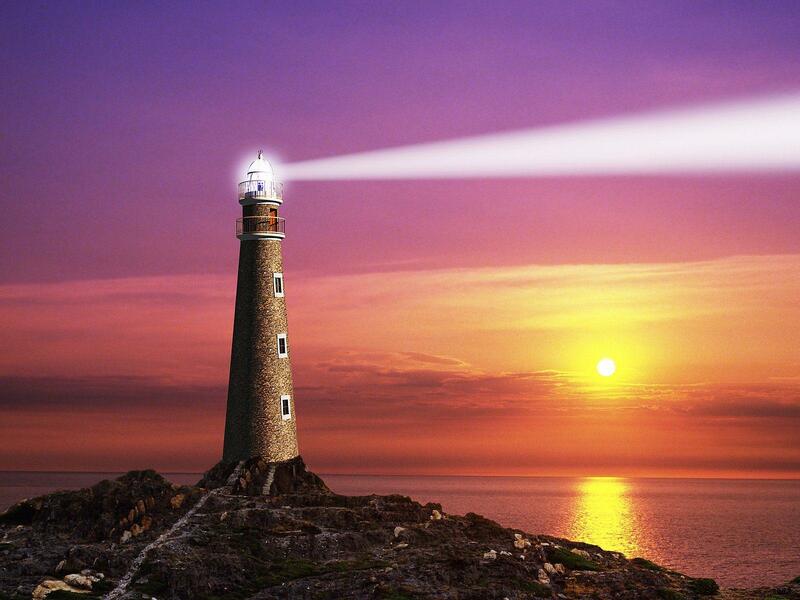 Just as a ship searches for land with the assistance of a lighthouse beacon in the midst of a storm, Yehovah created these signs for us to see (as a monument or flag) from where we can then determine, for ourselves, His times and seasons. We know, then, that the sun and moon serve as these beacons - the two great lights in the sky above us. Even the stars communicate to us in the form of signs to signal the night apart from the day. His signs are not used as Pagan fortune teller's practice to predict future events, but to serve as a point of reference at any given time. "appointed time, place, or meeting"
"'Speak to the children of Israel, and say to them: "The feasts (mow'ed) of the LORD, which you shall proclaim to be holy convocations, these are My feasts (mow'ed). Six days shall work be done, but the seventh day is a Sabbath of solemn rest, a holy convocation. You shall do no work on it; it is the Sabbath of the LORD in all your dwellings. These are the feasts (mow'ed) of the LORD, holy convocations which you shall proclaim at their appointed times (mow'ed). On the fourteenth day of the first month at twilight is the LORD's Passover."'" Astrology, the study of celestial movements as having an influence in human affairs (such as horoscopes and other mythical practices based on the movements of the heavenly bodies), is different from Astronomy. The latter is the mathematical and observational study of those objects to better understand the universe and its overall function. Prognosticators, as they are called in the above verse, are forecasters who claim to obtain special knowledge of future events who, then, make supposed intimate predictions about one's life or group of individuals based on their secret understanding. As we can see, being driven to worship the signs of the sun or moon as entities or those that study them - even if it's fashioned in a manner to give praise to Yehovah - would also be a sin. They are merely objects that Yehovah uses (and ordained) in order for us to understand His timetable. Seeing them in the sky, or observing their motions, is completely different from worshiping them. It would be no different to observe them in the sky than it would be to look at the hands of a watch (unless, of course, we fashion our watches to praise and worship as the creators, or gods, of time and space). Yeshua refers to the summer season here. But he's not referring to the mathematical concept of the summer solstice (or the spring equinox); rather he is putting his reply into context by describing the use of observable signs to determine the arrival of future events - in this case, the growing season! But he stopped short of predicting when the exact sign, or date, would occur. Instead, he described multiple events that will serve as a sign of the end-time age. And ALL of these events would be required to take place for anyone to know that the time is very near. The disciples learned that they would not be able to predict, even with the use of mathematics, when these things would eventually take place, but they clearly understood the analogy when Yeshua referenced the sign of the fig tree to determine when the time would eventually arrive. This same principle can also be applied to the Biblical calendar. If we truly desire to know when Yehovah has appointed His Holy time, then we need to be like watchmen! By actively observing the ordained tangible signs given to us, the search for His timetable stays forefront in our minds and builds anticipation for His appointed festivals - something that can be easily taken for granted when relying on invisible abstract calculations (especially when calculation is not given to use). Only by observation of His ordained signs can we truly understand in our hearts that we are proclaiming and guarding His time properly. Now that we have a better grasp on these lights serving as "signs (observable in the sky) and seasons (to determine His Feast days), and for days and years", let's begin by looking at what constitutes a Biblical Day by using these signs.